Bright Green Technology has produced it’s biggest dynamic white light box to date. 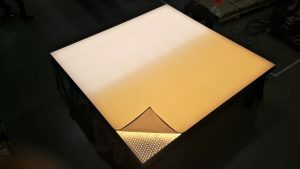 The huge 2.4 x 2.4 meter fabric face box is back illuminated by Bright Green Grid and features controlled white colour temperature between 2700 and 6500K. The boxes are installed in a mixed use space – the dynamic lighting effect is used to tailor the atmosphere event by event.